John Hughes movies. Big hair and parachute pants. Hair metal and New Wave. All of these popular things that emerged from the Eighties evoke so much fond nostalgia, proving it was an electrifying time to be alive. And just as much as the wild and wacky was a prevailing constant, the decade also was a catalyst in radical innovation for electric guitars. From locking tremolos to higher-output pickups (it was all in its nascency), there was no limit to how far you could modify a guitar. Guitar shapes were reimagined and finished in flashy paint jobs and outrageous graphics that made the electric guitar the ultimate symbolic accessory of a rock star. Jackson Guitars was one of the handful of companies at the forefront of this revolution when a rising star named Randy Rhoads designed a guitar that would eventually become the most renowned model in their line. Since then, Jackson has gone on to create a bevy of iconic shaped guitars, like the Soloist reviewed here, that still remain in production. 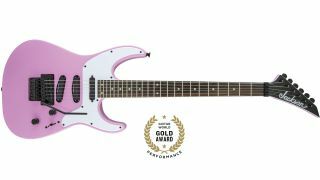 Now, looking at this fantastic Jackson X Series Soloist SL4X — gloss-finished in an unapologetic bubblegum pink — makes me want to grab a can of Aqua Net and let everyone know it’s glaringly apparent that any report of the Eighties’ demise has been greatly exaggerated. FEATURES The Soloist shape has been around for decades, but the Jackson SL4X elevates its aerodynamic look in cleaner lines and sleek contours, with white neck binding and a single-ply white pickguard, making it look like the most polished of superstrats. It features a one-piece through-body maple neck coupled with a basswood body, 25.5-inch scale length, graphite reinforced neck and scarf joint, a 12-16-inch compound radius rosewood fingerboard with 24 jumbo frets and dot inlays, and a recessed Floyd Rose Special double-locking tremolo. The SL4X’s drivetrain consists of a triple single-coil configuration of Duncan Designed HR-101 Hot Rails ceramic magnet pickups (with the bridge and middle screwed directly into the body) that offer more bite and power than some humbuckers. Combined with a five-way blade pickup selector and a master volume and tone, the tonal character of the SL4X is unlike anything in Jackson’s stable of shred guitars. PERFORMANCE Let’s first deal with the elephant in the room: Yes, it’s pink (and it does come in other equally loud colors). But let’s be honest, if you’re going to drive a Ferrari or a Lamborghini, you want it in a color you can see from a mile away. Strapped and plugged in, the SL4X is about the most fun you can have with a guitar that’s clearly designed for enduring high-speed performance. The flatter compound fingerboard radius, low action and slim neck profile make playing the guitar effortless across the whole neck span with nary a fret out or buzzing. The Floyd Rose tremolo keeps the guitar locked in tune and enhances harmonics when you dig into notes. But most of all, I love the wealth of tones I can achieve with the dual blade Hot Rails, which have a warm open sound on clean settings but become far more aggressive with scooped mids when introduced with high gain. I believe its neck-through body construction allows for more sustain and makes the pickups ring with clarity, mostly because I found myself using the bridge-and-middle, and middle-and-neck positions far more often for nuanced hard rock and metal tones.